David Cross has been one of my favorite comedians since 2002’s standup album “Shut Up, You F*ing Baby!” His performances in “Mr. Show” and “Arrested Development,” along with his various movie roles, definitely haven’t hurt. He’s awkward, funny and strangely confident and self-deprecating at the same time. So after getting a sneak preview of this show during a 2010 David Cross stand-up show in Chicago, I was surprised to find myself a little hesitant to check it out. It seemed a little forced and a lot unfunny. And that’s pretty much how the pilot episode plays out. Will Arnett basically reprises his Gob character from “Arrested Development” – boorish, coarse and stupid, while David Cross plays pathological liar and bumbling idiot Todd Margaret, a timid temp worker who stumbles into a job offer on the other side of the pond selling energy drinks. Once he arrives he meets his assistant Dave (Blake Harrison), who takes much joy in misleading Todd at every turn, and friendly cafe manager and experimental chef Alice (Sharon Horgan), who seems to befriend him out of pity. The various situations that play out in the six episodes of this brief first season (or series one, since we’re in England) are occasionally funny, but often fall flat. The situational humor (Todd has lied that he’s allergic to nuts and is now getting stabbed with an epi-pen!, Todd has lied that he lives in the Houses of Parliament and is now being arrested for trespassing!, etc…) seem like good ideas but rarely feel executed properly. Additionally, there is a surprising amount of slapstick thrown in that seems incongruous with the awkward comedy style that the writers (Cross is a co-writer here) are going for. 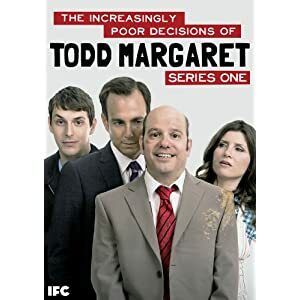 No user commented in " DVD Review: The Increasingly Poor Decisions of Todd Margaret "